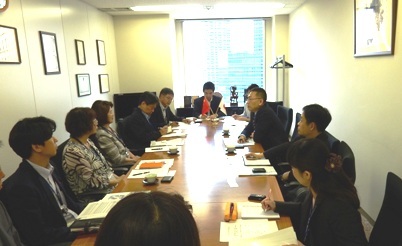 Mr. KANG Bingjian, Division Director, and Mr. XIE Cheng, First Secretary, Ministry of Commerce of the People’s Republic of China which is one of the Operating Committee members in China of “Japan Human Resource Development Scholarship for Chinese Young Leaders” (JDS China) under the Ministry of Foreign Affairs of Japan, visited JICE on June 5th, 2014. This visit was made as part of exchanging views on implementation of JDS China. We received useful comments such as the learning of Japanese for JDS China fellows, a follow-up activity for alumni and so on. 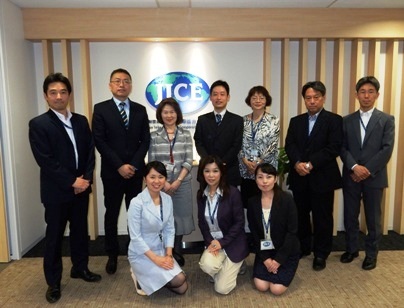 JICE provided information on JICE activities such as the Management of International Training Programs including China Division, Social Integration and the International Exchange Program called JENESYS (Japan-East Asia Network of Exchange for Students and Youth). Taking this opportunity, JICE will deepen the trusting relationship with the Ministry to implement JDS China.